The EV automaker plans to deliver its Model 3 long-range segment in EU by February 2019. EV auto giant, Tesla Inc. has recently received approval from the Netherlands Vehicle Authority (RDW) to deliver its Model 3 segment in Europe. For the record, RDW is the European regulator that Tesla uses to receive approval for its vehicles on European roads. Confirming the approval, RDW on behalf of EU said that the automaker’s Model 3 segment has met all needed requirements for the European roads. Meanwhile, a Tesla spokesperson said that the deliveries of the Model 3 long-range variant are expected to commence in the region by February 2019. A cargo ship carrying over 1,000 Tesla Model 3 were reported to export from San Francisco, likely to arrive at the port of Zeebrugge, Belgium by February 2nd, 2019. According to Electrek, the company that carries outs vehicle unloading at the Port of Zeebrugge plans to handle around 3,000 Model 3’s per week starting February. The company has been tracking the vessel that is carrying the Model 3’s and it was reportedly spotted entering the Panama Canal recently, claim reports. Incidentally, Tesla is setting out its least-expensive car in Europe, where EV sales have surged since 2018. Reliable sources claim that Europe will be an ideal market for the EV automaker’s future as Tesla CEO, Elon Musk, announced that the company plans to build its European Gigafactory in Germany dedicated for producing Li-ion batteries for Tesla cars. 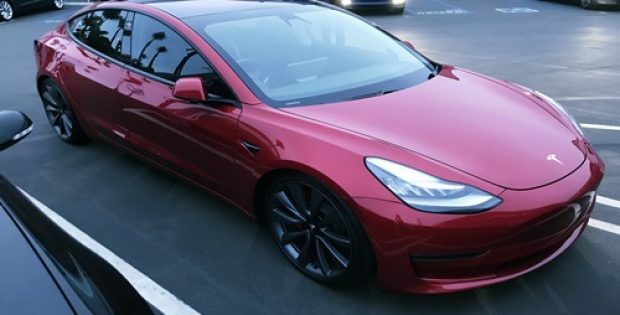 As per reports, Tesla has already received around 14,000 Model 3 orders in Europe as of earlier January 2019, numbers that are likely to grow since the automaker has now opened Model 3 orders to the public in China and Europe, were earlier it only took orders for the Model 3 Performance and Dual Motor AWD variants, which happen to be the company’s most expensive EV segments.